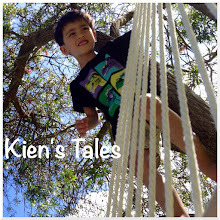 It is so amazing that in such a short time Kien has become so much more interactive. Here is a clip from 3 weeks ago of Kien having fun...just so innocent. The other day we took him up to Ponsonby Rd to play under the Telecom Xmas tree. He had a blast zooming around on the beanbags. The following morning I found some bean bag filler in his nappy - it really surprised me how quickly things pass through his system! Unfortunately we haven't resolved the vomiting situation. The Dr at Starship was not concerned with his vomiting at all because he was putting on weight. She thinks it is reflux but has suggested cutting back on the losec since it doesn't seem to be helping. It really is so frustrating! We will have a followup appointment in a couple of months time.